Creamy Avo Spinach Raspberry Smoothie, a simple green smoothie made with spinach, avocado, and raspberry sauce. The perfect plant-based way to start your day! Creamy Avo Spinach green smoothie: Combine avocado, spinach, banana, and milk in a blender and pulse until smooth, adding more milk if needed. Set aside. Raspberry sauce: Blend fresh raspberries raspberries in blender. If too thick, add a splash of plant-based milk or water to provide liquid consistency. 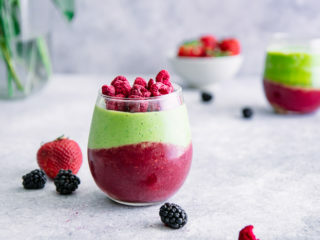 Pour raspberry sauce into bottom of glass and then top with green smoothie, adding optional toppings if using (I used freeze dried raspberries). Enjoy! *If banana is not frozen, add 2-4 ice cubes to blender with green smoothie ingredients. Leftovers & Storage: This green smoothie recipe can be frozen for up to two days, however the texture be icy and not smooth. We froze one portion and enjoyed it two days later and it was still delicious, but had a thicker and icier consistency. Nutrition: This Creamy Avo Spinach Raspberry Smoothie is a good source of fiber and is low in sodium and saturated fat. It also provides healthy fats, which contribute to brain health and keep you full and satisfied.